After submission, watch your email inbox or spam folder for a copy of your submission for your records. 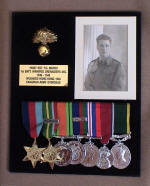 Thanks to the dedication and generosity of Thomas Marsh's son Vic, Sgt Marsh's Memoirs are now published on this site. These are a work in progress, as Vic along with others is still checking some parts of the content for accuracy. In order to make reading on the screen easier, some formatting changes have been made from the original document which Vic holds. You will find navigation links at the bottom of each page. For those who wish to download a copy and print it, a Portable Document Format (PDF) copy is available. My boy, Thomas was born May 4th, 1915, in the railroad town of Transcona, Manitoba, six months after the First World War had started. I had been four years in Canada at the time, migrating from England in 1911. I married his mother, Sue Garner, from Kent, England, in April 1914. The Reverend Phillip Barker, a valued friend of the family officiating. Joining the Canadian Army in 1916, I went overseas with an infantry draft of the 44th Battalion C.E.F., six months later my wife and little boy Tommy followed. They lived mostly in the south of England – garrison towns, training centers, etc., and later, when I returned wounded, near hospitals and rest camps. It was here that I believe Tommy got his first liking for things military. He had a mass of golden curly hair, an engaging smile, and – if I do say so myself, a very pretty mother. The Canadian boys made a fuss of the lad. Often he would run to a Canadian soldier as soon as he saw the Maple Leaf badge, crying “Dada!” much to the embarrassment of his mother. He also learned something about the enemies of his country. At Folkstone, where they stayed, German zeppelins and planes came over on several occasions and bombed the town. The people stampeded to comply and an older child who had him in charge deserted little Tommy. Frantically running to catch up with the deserter, as well as his short chubby legs would let him, he fell flat on his face and when picked up, mad as a hatter, forgot his fear of air-raids in his rage at the girl who left him behind. At night he was often plucked from his bed, wrapped in a blanket and hurried down to the basement, where amid the boom and crash of the anti-aircraft guns he sat huddled on his mother’s lap till the all clear sounded. Returning to Canada in 1916, he manifested a liking for things military. As a schoolboy he collected brass buttons, badges, shell cases and other souvenirs of war. His pride was a German sniper’s helmet. He also had a scrapbook. In it he pasted pictures of interest that he had cut from the daily paper or some magazine. Nearly all these pictures dealt with scenes of war and the military. About this time the Chicago Herald, ran a particularly gruesome supplement dealing with the horrors of the First World War. It showed pictures of naked and mutilated dead men and women in the war zones. I remarked that they should be destroyed as morbid, but he managed to keep them. I think now that it was a premonition of what he would actually see and experience in later years. Of course he read many other books, his favorite being the old country book “Boys Own Paper” and “Chums”. Those who have read these books know that they are healthy reading, and help to form the best in a boy’s character. He was a participant, often a leader, in school sports and was a good swimmer and cyclist. At the age of fourteen he joined the Winnipeg Sea Cadets. At the time (1929 – the year of the great depression), this organization of loyal business men and youngsters, was so neglected by the powers-that-be that I remember my boy going around very proud of his naval uniform with a big patch in the seat of his pants. At nineteen he joined the 10th Machine-Gun Battalion of the N.P.A.M., stationed in Winnipeg under Lieut. Col. O.M.M. Kay. Two years later this outfit was amalgamated with the 1st Battalion Winnipeg Grenadiers. Thus in 1936 Thomas became a Grenadier. He attended drills and camps and was attached to “B” co. commanded by H.W. Hook (who later died in a prison camp at Hong Kong). Tom was very proud of his uniform and prouder still when he was promoted to Corporal. He worked hard during the day at this trade of decorator but never missed a parade at night or on weekends. In 1939 he became a Sergeant and an authority on the heavy machine-gun. This knowledge and training served him in good stead at Hong Kong where, at one time of emergency, he found that of the group he was attached to, he was the only one that knew about the Vickers to be able to take new parts from their packing and actually put the gun together that would work immediately without delay of further adjustment. An armourer usually does this work. There were two big events in his life that year. First, his marriage to a Miss Betty Horton of St. Vital, Manitoba, and secondly the visit of Their Majesties King George VI and Queen Elizabeth. Thomas always had a picture of the reigning Monarch hung in his room. First, George V, then Edward, and lastly the present occupants of the Throne. So he was exceedingly proud to be chosen as member of the guard of Honor at the Railroad Depot. How he scrubbed and polished. This was still a time of depression and many of the men in the Militia were out of work. Yet all donated their meager militia pay to Battalion Funds in order to hold their organization together. The men had to provide their own military boots and some on the Guard of Honor could not afford to do so. The Officers, out of their own pockets, provided them. This was short six months before the outbreak of the Second World War, a war that threatened the very existence of Canada and its people. There was not enough military equipment in Winnipeg at the time to properly equip a Corporals Guard. Many of these lads, who gave their pay; later gave their lives - all honor to them! They were the first to enlist in the active army and the basis of the firsts training of new recruits. They served well then, and later on the battlefront. May they not be forgotten! John Payne, Bob Manchester, Ken McCully, Earl Dickie and others – hastened to be the first to enlist. The Grenadiers were to be mobilized as an Infantry Battalion under their old commander Lieut.-Col. Kay. After a brief period of training they were sent to Jamaica in the West Indies to relieve an English regiment for front line service. They stayed fifteen months, returning to Winnipeg in October 1941 in fine shape. Perhaps some of them were a little heavy, as my boy weighed 190 lbs., quite difference to the 120 lbs. to which he was reduced in Japan. In Jamaica he was, for a time, in charge of the guards at a prison camp for Germans. The prisoners were well fed and were cocky enough to hoist the Nazi flag in their compound and make all inmates salute it. He saw the English Commandant; armed only with a walking stick, actually risk his life in separating opposing factions who were fighting. How different was his treatment when he, in turn, became prisoner. They had only been in Winnipeg a week when they were recalled from leave and told that the Battalion was leaving immediately for parts unknown. There was some confusion and annoyance at the haste of the departure. Thomas, however, accepted this curtailment, as one of those things that happens when a nation is a war and he reported promptly. He was put in charge of a patrol to round up stragglers in Winnipeg. He disliked the job at the time and the memory of it now even more. 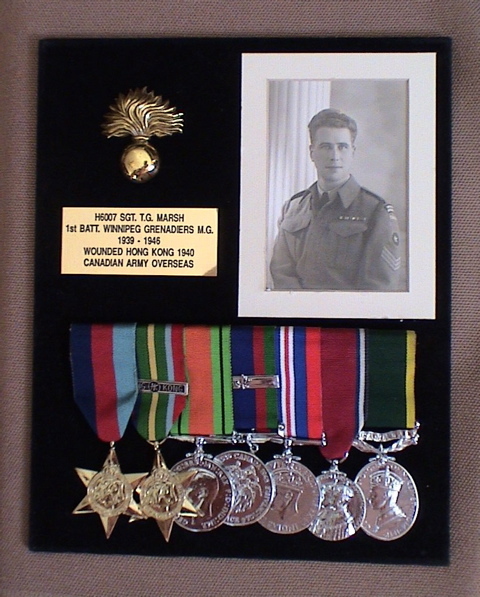 Some of those the patrol rounded up died in Hong Kong prison camps under distressful circumstances, but at that time it was his duty and he did it. Many of the Grenadiers were very indignant at having their leaves so abruptly terminated. Extra guards were posted at the barracks on Main Street as all were confined to barracks. On the 24th of October 1941, a fine day, the Battalion marched to the CPR depot to entrain for the East. They were a fine body of men – all over five foot nine inches. Many were the fond farewells – some, forever. As the train steamed out and they waved good-bye, little they thought that they were to be one of Canada’s Lost Battalions, the other being the Royal Rifles of Canada. They were to disappear, every man of them (except a few that skipped the boat at Vancouver) for four long years. Four hundred disappeared forever. Those who returned, we welcomed as returning from the dead. As you read my son’s story you will admit it was a miracle that as many did survive. It was not by the grace of the Japs they did so but only by their own courage and intestinal fortitude, for which the fighting men of Canada are noted and of which all Canadians can feel justly proud. With this short introduction I leave my boy Tom to tell his own story as he told it to us at home. I know you will find it very enlightening and interesting.